Langley is situated on the south end of Whidbey Island – less than an hour’s journey via Washington State Ferries from urban Seattle (it’s literally a 20-minute crossing). This one-square-mile town’s signature characteristics include a quaint, yet trend-setting downtown with a deep pool of resident artists and performers, artisans in nearly every medium, farmers, community involvement in local government, festivals, beaches, forests, pocket parks, a 250-seat performing arts center that presents local as well as world-class entertainment, a vibrant marina, and an eclectic food scene – with a population of approximately 1,050. Read more about Langley on the I Love Langley Facebook page. 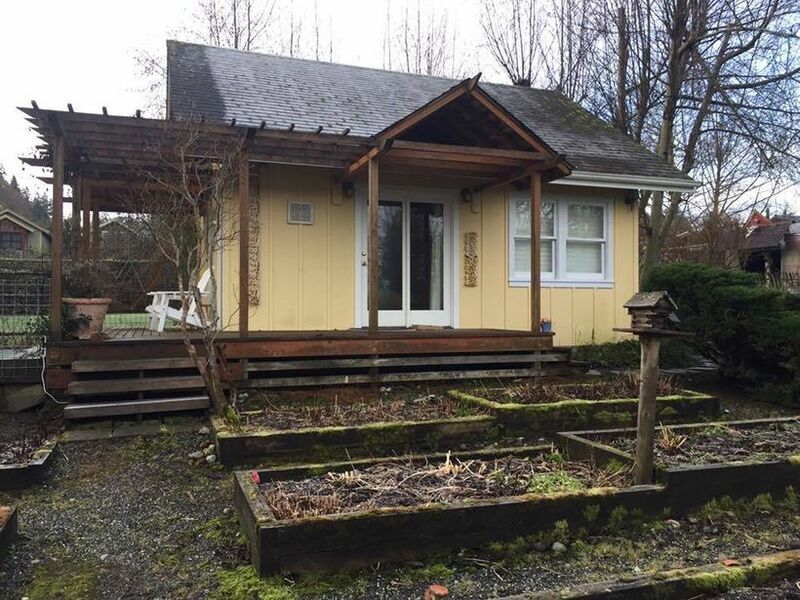 The Country Cottage of Langley Bed & Breakfast (215 Sixth Street, Langley, WA 98260) is a luxury B&B situated in Langley, Whidbey Island, Washington on a bluff overlooking the Village of Langley, Puget Sound and the Cascade Mountains. We dubbed it “Comfy Country Cottages” because of the sheer family friendly atmosphere and sense of relaxation we felt upon entrance into our weekend abode. There are six private cottages, each with a fireplace and large Jacuzzi soaking tub in the unit. Enjoy a freshly baked cookie upon check-in or a bite-sized cupcake upon check-out. Need a movie? There are over 200 titles to choose from right there at the main house. Each cottage comes fully equipped with free Wi-Fi (you will want to connect as it’s slow or non-existent around the island otherwise), DVD/CD and VCR players. Whatever you need, innkeepers Tom and Jacki have you covered. Don’t make breakfast plans anywhere else but here. The gourmet breakfasts at Country Cottage are a guest favorite with mouth-watering selections like Eggs Benedict, Eggs Florentine, Three Cheese omelets, and Dutch Baby pancakes. Fresh home-baked goods like Ginger Scones and Cranberry Muffins are not to be missed. You can enjoy your breakfast al fresco on your private deck or with other guests in the main “Four Seasons” mural dining room. If you have children, opt for staying in – you won’t regret it. 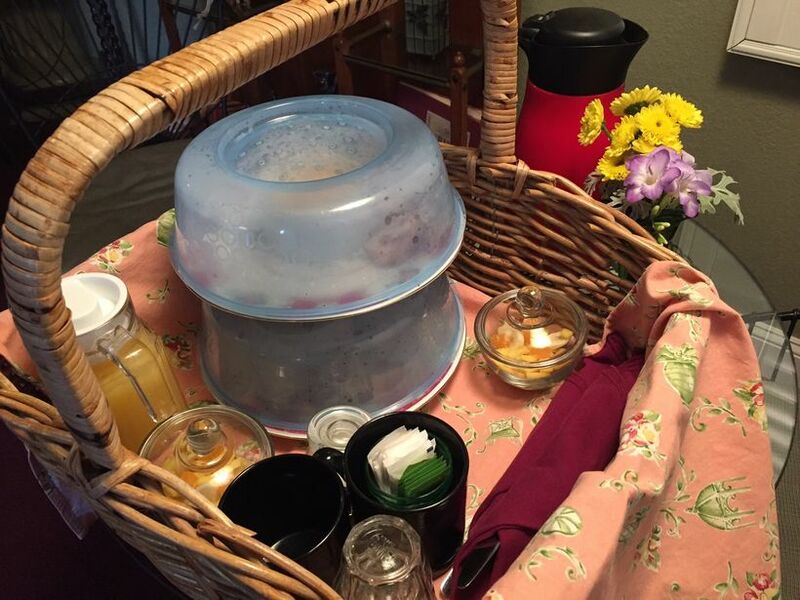 The personal space and ambiance available at your own dining table is unmatched. 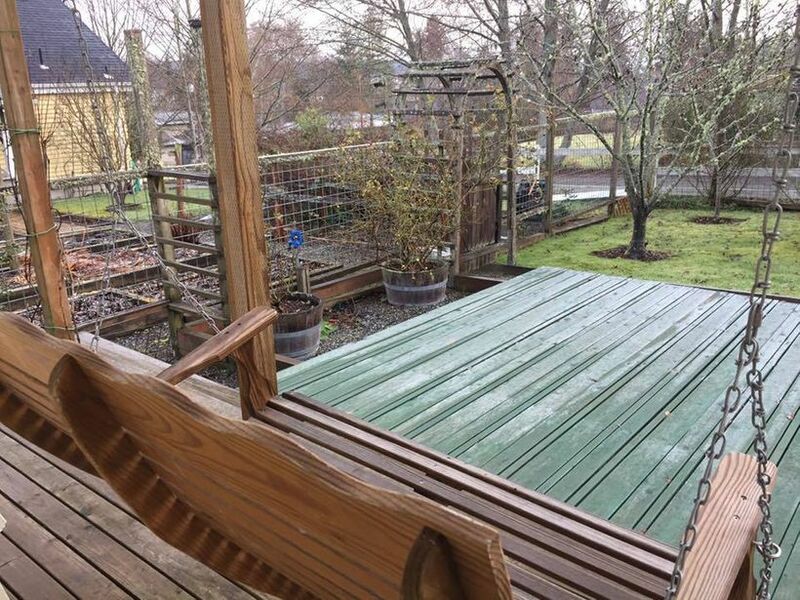 Following breakfast, the private deck on the side of the cabin is the perfect spot to sight deer and bunny rabbits. Speaking of which, a huge thank you to Act II Books and Puppets for helping to keep our little one active while we unpacked. Their bunny rabbit puppet was the star of our little girl’s show. Gift certificates purchased from May 1 to June 30 will include a bottle of Whidbey Island Wine and a basket of fresh baked pastries. Gift certificates are available by calling (800) 713-3860 and are available in any denomination or for a particular Cottage or package. Positioned in the Puget Sound “rain shadow,” Whidbey Island’s cool climate makes it an ideal harvesting ground for award-winning wines. The summer’s long, dry growing season allows acids and sugars to balance in a marine-like climate that’s difficult to top. The Whidbey Island Vintners & Distillers Association offers an annual chocolate-pairing event over two weekends taking part across five venues throughout Southern Whidbey Island. Appropriately dubbed, “Red Wine & Chocolate,” local winemakers and distillers pour a selection of exquisitely hand-crafted wines and spirits and pair them with specially selected chocolates for their guests. Tickets for the tour cost less than one bottle of fine wine (in most cases) and are available in advance ($25) or on the tour day of ($30). Tickets include a souvenir glass, spirit tastes and chocolate treats. The following five stops were all worth the relatively short drive from our coveted cottage in Langley. Here they are in the order enjoyed. 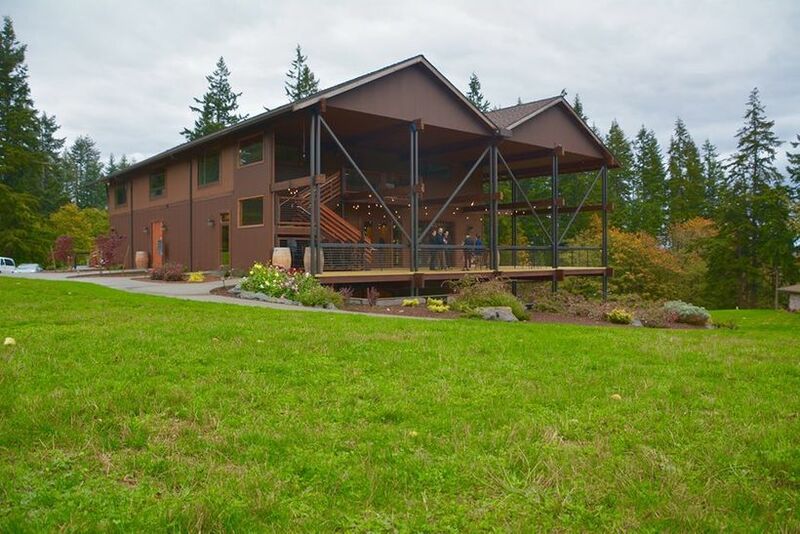 Holmes Harbor Cellars (4591 Honeymoon Bay Road, Greenbank, WA 98253) is located on a 20-acre wooded estate overlooking Holmes Harbor in Greenbank. Their award-winning limited-production varietal and blended wines are the envy of the proverbial ball. This is the real deal. 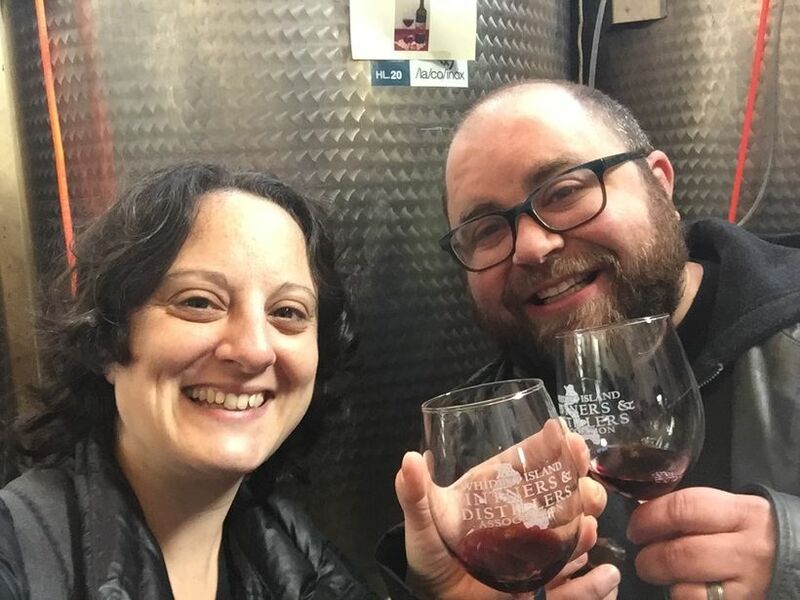 Winemakers Theresa and Greg Martinez skillfully combine their passion for art and science to create a perfectly balanced wine experience. Les Collines (The Foothills) Vineyard is one of the highest in the Walla Walla Valley with an upper elevation of 1,500 feet and is internationally certified for Sustainable Farming by the IOBC. It’s also certified as a Salmon Safe Vineyard. Blooms Winery in Freeland has been in operation since 2003 with an offsite tasting room open to the public at the historic Bayview Corner just outside Langley (5603 Bayview Road, Langley, WA 98260). Blooms Winery is open seven days a week with presentations touting local artists and live music to keep patrons on their toes. If you come hungry, Blooms Winery serves food (small plates), beer and non-alcoholic beverages in addition to their award-winning wines. 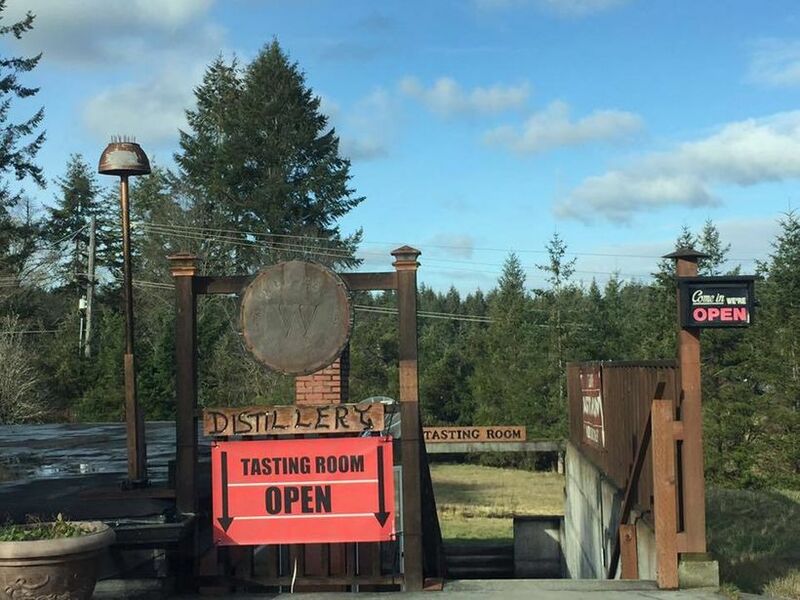 Whidbey Island Distillery (3466 Craw Road, Langley, WA 98260) is a Heising family-owned establishment in Langley known for its Loganberry Liqueur. Once you taste their award-winning liqueurs, you’ll understand why it’s hard to select just one to wrap up for home! Whidbey Island Distillery is a welcome reprieve from the ordinary tasting experience. This is the place where spirits meet their match. 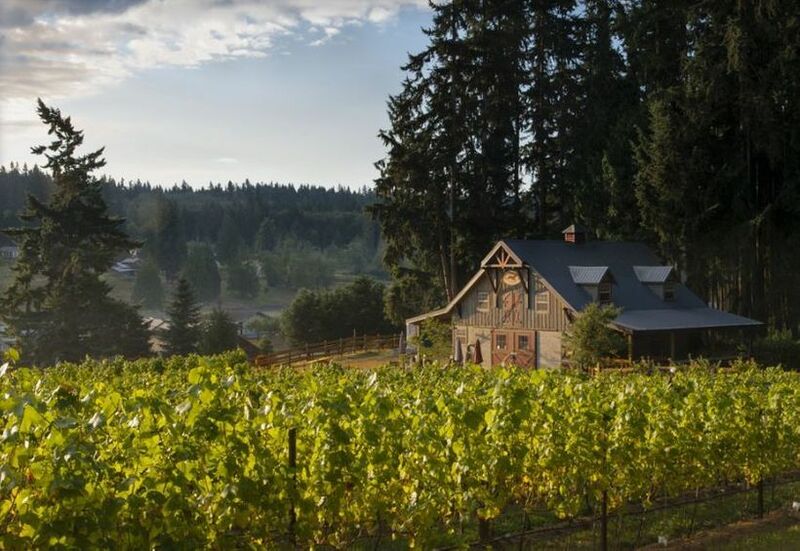 Spoiled Dog Winery (5881 Maxwelton Road, Langley, WA 98260) in Langley is as much known for their hospitality and kindness as they are for their award-winning varietals. Whether or not dogs are your forte, Australian Shepherds Blue and Sami have a way of stealing your heart. Comforts of Whidbey (5219 View Road, Langley, WA 98260) in Langley overlooks the Puget Sound and doubles as an event rental space. 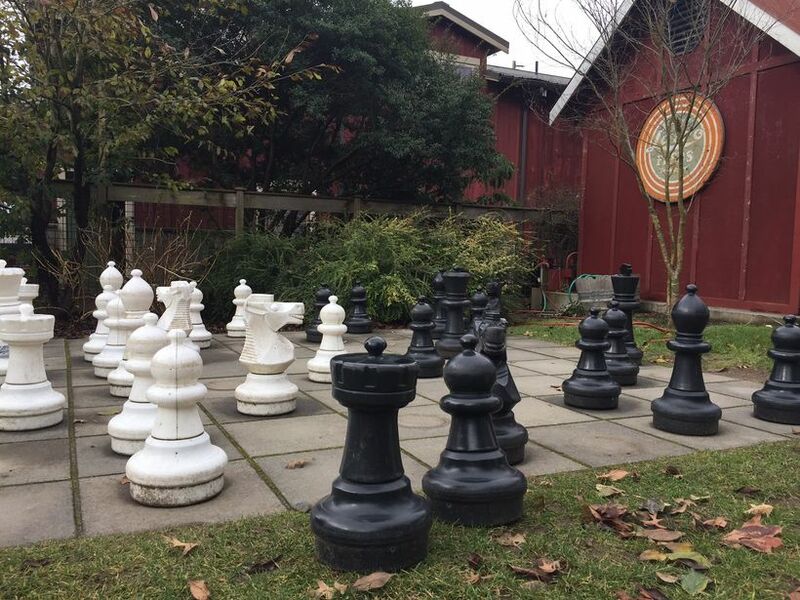 The family-run farm and winery is an ideal spot to stop and enjoy a taste of local wine. Their vines include Siegerrebe, Madeleine Angevine, Madeleine Sylvaner, and Pinot Noir. Carl and Rita Comfort bought the 22-acre farm in 2006 and, in 2010, converted an existing building into their winery and tasting room. In 2016, they finished the new tasting room, winery and event space on the property, complete with a bed and breakfast set to open early 2017. The dates for next year’s Red Wine & Chocolate Tour have been announced as February 10-11 and 17-18, 2018. Prior to that, the next Whidbey Island Vintners & Distillers Association event is the Savor Spring Food, Wine & Spirits Tour running May 20-21, 2017 ($20 advance or $25 day of). Okay, so the first two things definitely go together and maybe the third, but in this case: they were all separates functioning to sustain us during our weekend on Whidbey! 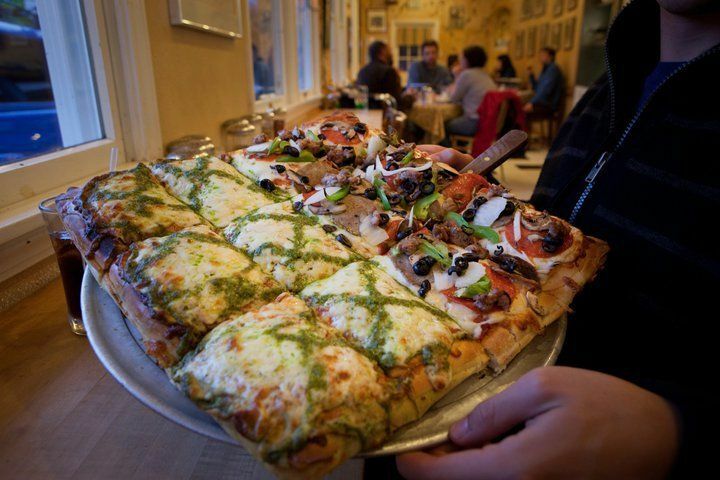 Basil Café (5603 Bayview Road, Langley, WA 98260) is immediately around the corner from Blooms Winery and the perfect stop to fill up between tastings. Basil Café’s healthy light Asian flavors walk the span of traditional Vietnamese, Chinese, Thai, Japanese, and modernly creative Asian dishes. They offer a wide selection of gluten-free, dairy-free and vegan dishes – perfect for guests with dietary restrictions. We tried the fresh rolls with tofu, salad and basil served with peanut sauce to start, followed by the Tofu Chow Mein (fresh tofu wok stir fried with onion and vegetables in house sweet sauce) and General Tso Tofu (fried tofu and broccoli stir fried in house spicy sweet sour sauce). 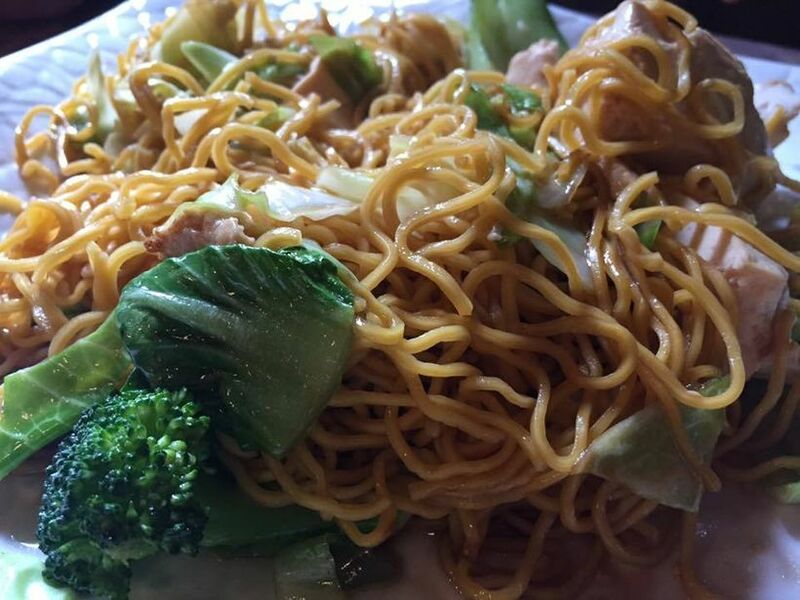 Our daughter, who is usually quite picky with her food, couldn’t get enough of the “noodles” at Basil Café! While in Langley, we also tried the authentic New York hand-tossed pies from Village Pizzeria (106 First Street, Langley, WA 98260). I opted for the deep dish Sicilian cheese pizza and was not disappointed. My wife wanted to try the thin version for comparison so we each ordered our own “small” dishes. Yeah, right! We had leftovers, literally, for days! Pro: The restaurant overlooks Saratoga Passage so the views are out of this world incredible – a perfect match for the mouth-watering food. Con: The ambiance leaves a little to be desired and there seems to be a long wait for seating and service once seated. If you can get past that (if you don’t have small children and aren’t in a rush), Village Pizzeria is worth the wait. Turner & Bea’s Rosemary Crackers are heavenly. The pairing of the perfect amount of salt and rosemary to each cracker is lip-smacking delicious. The best part is that these crackers are made locally on Whidbey Island, so you can feel accomplished knowing you helped keep a local company in business by eating cheese and crackers. Win-win! Kudos to The Midnight Kitchen Catering Company for a slam dunk in producing these goodies. 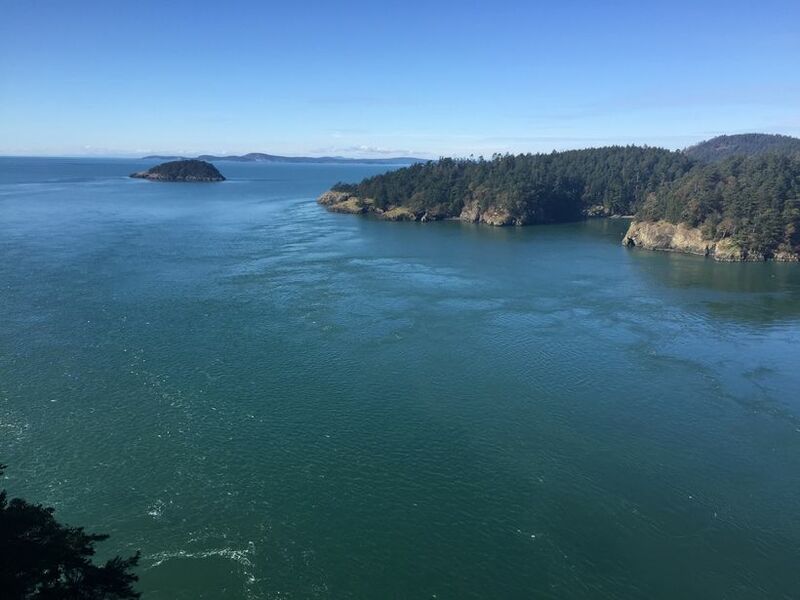 You mustn’t leave Whidbey Island until you see Deception Pass. It’s worth the drive to the top of the island! Psst…you can also drive all the way back to Seattle if you want – it’s a little longer, but worth the experience! Check out this map to plan the scenic route home! 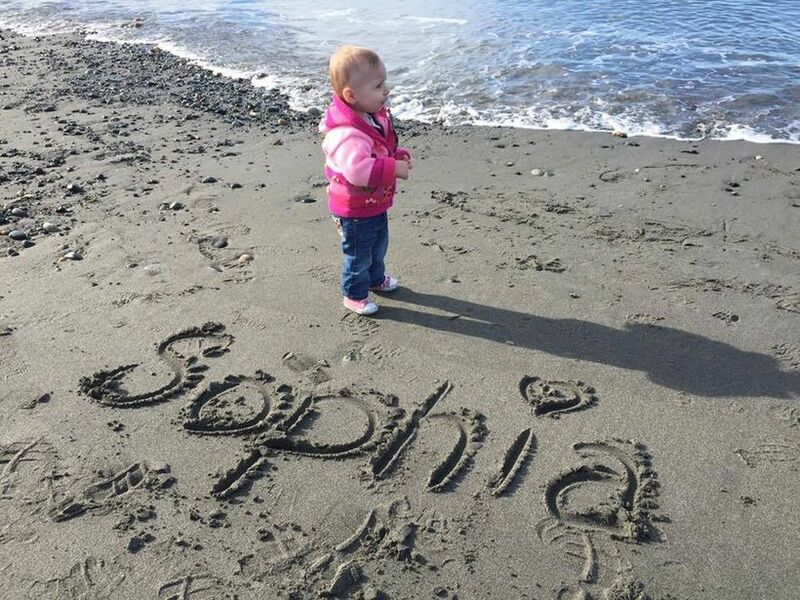 Make sure to check out WhidbeyCamanoIslands.com to plan your next family adventure!